Interestingly, the US dollar failed to rally much despite news US CPI rose by 0.4% month-over-month, which lifted the year-over-year rate to 1.9%. In fact, the GBP/USD pair hit a new session high of nearly 1.34 after the release of US inflation figures, which goes to show strength of the pound’s rally. As before, we continue to expect the GBP/USD will reach 1.35 in the coming days. But understandably, the cable does look a little overbought in the short-term so a small pullback wouldn’t come as surprise to us now. 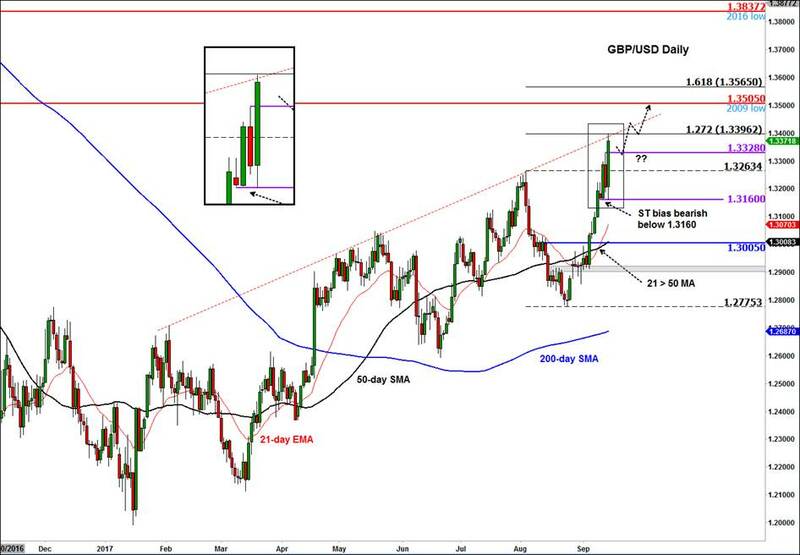 In fact, the GBP/USD has hit one of our bullish targets at just shy of 1.34. As can be seen, it has reached the 127.2% Fibonacci extension level of the last corrective swing. The 161.8% extension level comes in at 1.3565, which sits 60 pips above the next key target at 1.3500/05 area. This psychologically important level was also the low from the year 2009. Once support, it could offer some resistance. Meanwhile on the downside, we expect the broken resistance levels to turn into support, starting with 1.3325/30 level. But any move below 1.3160 – support and today’s low – would mark the end of the current uptrend.